Advice and demonstration of home care techniques for prevention of dental disease. Oral exams to assess the teeth, gums, and other oral structures for infection, inflammation, and tumors. Dental cleanings and extractions involve general anesthesia to allow careful evaluation of all sides of the teeth and needed treatment without pain or anxiety. After the oral exam is complete, we use hand tools, an ultrasonic scaler, and polisher to remove all tartar above and below the gumline. We are firm believers in comfort, and all pets receive pain medications and laser therapy based on need. Safe anesthesia is always a priority; therefore, pre-anesthetic bloodwork and careful monitoring is used for every procedure. Treatment plans, which include costs, are available upon request- we welcome any questions you may have! Ideally, all pets would say "ahh" for dental cleanings, but in REAL life thorough dental cleanings require anesthesia. Without anesthesia, even the best patients will not allow adequate oral exam, tooth probing, and most importantly subgingival (below the gumline) cleaning. The instruments we use are sharp, have moving parts, or squirt water and your pet needs to be perfectly still so they don't get hurt. Anesthesia makes this possible. This is an important point because veterinary dental cleanings are NOT the same thing as when laypeople (groomers for example) "clean teeth". Hand scaling teeth without anesthesia can make the mouth look better temporarily, but it does not address any disease occurring below the gumline or in hard to reach places. Discuss any concerns you may have regarding anesthesia with your veterinarian for more details. Generally speaking, the risk of anesthesia is minimal compared to the risk of dental infection. We recommend pre-anesthetic bloodwork prior to all of our dental cleanings. The blood is analyzed for indications of liver or kidney disease, blood sugar abnormalities, and anemia. We use this information to look for underlying internal disease and formulate our anesthetic protocol for your pet. We also are looking to see if dental infection is affecting your pet's internal organs. Your vet will discuss with you the extent of testing recommended depending on your pets health history. The science of anesthesia and pain control has come a long way in recent times! Generally, our patients receive pre-anesthetic medications to ease anxiety and control discomfort. If your pet has teeth extracted, additional pain medications will be given during the procedure and also sent home. A comfortable mouth is a healing mouth! For the most part, we use a gas anesthetic similar to what is used in human hospitals. This gas is delivered via a tube inserted into the windpipe once your pet is unconscious. This tube insures that your pet gets adequate anesthesia and oxygen while protecting the airway from water and saliva accumulation. Talk to your vet regarding anesthesia recommendations, risk, and safety measures for your individual pet. The first step in any dental cleaning is a thorough oral exam- all the structures of the mouth are assessed for signs of inflammation, infection, foreign objects, and cancer. If significant tartar is present, the bulk of it is removed with a dental extractor so that the periodontal probe can be used to evaluate the gumline for periodontal disease. All sides of each tooth are probed- deep pockets between the gum and tooth or defects in enamel can be found this way. "Periodontal disease" is infection that is causing the gum tissue to separate from the tooth- leading to loose teeth, pain, and possibly body-wide infection. Dental extractor (top instrument) and a Periodontal probe (bottom instrument). This pet has large, thick deposits of brown crust on the teeth - this is hardened, mineralized tartar or "calculi". In the pictures above, bulk tartar is being cracked off the surface of the tooth using the dental extractor. Notice that the tooth surface is nice and white underneath the tartar- pets don't often get cavities like humans do; it is much more common for pets to get periodontal disease instead. You can see in the first picture that after the tartar is removed, there was so much infection around the upper largest tooth that the tooth roots are showing when normally healthy gums would cover them. bulk tartar from the inner surface of the bottom row of teeth. This area is not accessible unless the pet is under anesthesia. A periodontal probe is a thin metal instrument with graduated markings on the side. The probe is placed gently under the gumline and ran around all the surfaces of each tooth. This probe can detect "pockets" or places where infection have separated the gums from the tooth. The depth of these pockets can be measured using the probe to determine if the tooth is salvageable or needs to be extracted. This pet's upper fourth premolar (largest tooth on the rear upper jaw) has a very deep periodontal pocket as evidenced by being able to insert the probe completely under the gumline. Large chunks of tartar are removed with hand instruments, but all the rest is dealt with using an ultrasonic scaler. This machine uses ultrasonic vibration to break tartar off the tooth without scoring the tooth enamel. The vibration can cause this instrument to heat up, so a constant spray of water is emited from the tip during its use to prevent heat damage to the tooth. 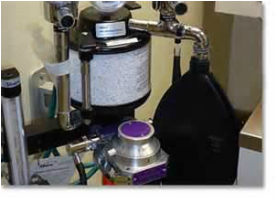 This is a closeup of our ultrasonic scaler and the variety of bits used to clean tartar above and below the gumline. After all visible tartar is removed with the ultrasonic scaler, a disclosing solution is used. The solution is applied to each tooth and stains any remaining tartar bright pink. This is our "double check" to make sure that the mouth is as clean as we can make it. Sometimes the solution can get on the fur surrounding the mouth during the procedure and your pet may go home with a pink stain, but this fades quickly. After all visible tartar is removed, all sides of each tooth are individually polished. Polishing paste is applied to the rotating soft rubber cup of the polisher. This is a closer look at the high speed drill and a variety of drill bits needed during tooth extraction. Our overall goal is to preserve as many healthy teeth as possible- if teeth are extracted, this is because the teeth are diseased and your pet will have a better quality of life without them. 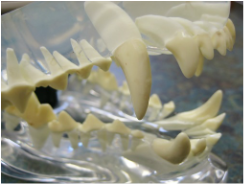 Many of the teeth in our pet's mouths have multiple roots which are deeply set within the upper or lower jaw. The tooth model to the left demonstrates the length of tooth roots. Often diseased teeth will need to be cut into sections with the drill and removed in sections. Great care is needed during this procedure in order to prevent tissue trauma and bone damage. Finally, laser therapy is applied either to the gumline where gingivitis is present or to any tooth extraction site. Laser therapy uses a beam of laser light to penetrate tissues without damaging them and induces a biological response in the cells called "photo-bio-modulation". The benefits of laser therapy include: decreased gingivitis, faster healing time of extraction sites with less pain, and decrease in the bacteria within the mouth. If a dental cleaning is all your pet requires, it is usually a day procedure. The appointment is scheduled in the morning and your pet is ready to go home by the afternoon. When you pick your pet up, we will go over our exam findings, discharge instructions, and any needed medications. We will also discuss dental preventative measures you can employ at home to try to keep the now healthy teeth in good condition!